The tragic events of September 11 are fresh in the minds of virtually every American who lived to tell the ordeal. The Heathrow plot of 2006 is still a nagging feature in the government’s security department. All these eventualities and others prior to these ones point out clearly that the security and economic prosperity of the US depend not only on its capitalistic or4iented market but also upon the secure operation of its aviation system. Terrorists, hostile nation states and criminals have, for a long time, viewed aviation as a target for attack and exploitation to pass their messages or achieve their goals. This reality has led to the USA taking extra measures to beef up its aviation security apart from the existing policies and regulations as shall be discussed later. In the wake of the looming aviation security threats, the government has reacted in a number of ways although most of the responses are implemented after damage has already being done (Elias, February 2, 2009). Following the London based 2006 plot against U.S commercial jets, the US government, through the Transport Security Authority has come up with newer models of detectors that are devised to counter such particular threats. The use of this technology has two benefits. One, if properly handled, it can effectively detect attempts to bring explosive on board aircraft. In addition, the proper use of these gadgets may deter terrorists from using this method in attacking civil aviation. This is because the method helps detect terrorists who are mere ‘dry runs’ and who are probing the effectiveness of the technology overseas. This was the case with the 9/11 attacks (USA GAO, July 21, 2007). In addition to the above technological advancements, the US government has extended its response to aviation security threats to incorporate other states. In particular, it has taken action against nations that have lax security standards. Such actions have included banning flights to the countries involved as it was with the case of Nigeria in 1993 when flights between the Murtala Muhammed International Airport in Nigeria and the US were banned until 1997. The government has also imposed mild bans on other states occasionally like in the case of Indonesia and Haiti and Greece in 1996 (Stewart, November 23, 2010)..
Another reaction by the US government to curb the growing aviation insecurity is the introduction of secondary screening on US bound planes. This is an extra type of screening in addition to that at the normal airport checkpoints. These screenings have been effected through a modification of bilateral agreements proposed by the Federal Aviation Administration (FAA). This measure was put into place after the destruction of Pan Am 103 in 1988 by pro-Libya terrorists. In this case, the normal screening had been performed by the air carrier personnel in collaboration with local authorities with the latter being inefficient. This led top the terrorists tasking advantage of the situation. The US Congress passed the International Security and Development Cooperation Act in 1985 in its continued effort to fight aviation security threats. This Act requires the government to assure the levels desired of security on flights into US. If the foreign governments fail to cooperate, the President is given the mandate of prohibit the air carrier from providing transportation. This Act was enacted following a trail of terrorist attacks in the Middle East that lead to the hijacking of a TWA Flight 847 after it departure from Athens (Elias, February 2, 2009). The above measures are just a few among the many measures that the US government is deploying to reduce levels of aviation security threats on its soil or of its flights. Apart from these measures, the government has a comprehensive policy and regulations to improve security. These are contained in an Aviation Operational Threat Response Plan dated 26 March 2007 by the government to support its National Strategy for Aviation Security. The strategy is in the form of seven supporting plans. The first plan is the Aviation Transportation System Security Plan that directs an approach that is risk-based in order to develop and implement measures of reducing vulnerabilities within the Aviation Transport System. Another plan is the Aviation Operational Threat Response Plan. This plan prescribes inclusive and harmonized protocols in assuring an efficient US government response to air threats against the Nation and its wellbeing (USA GAO, July 21, 2007).. The Aviation Transportation System Recovery Plan defines ways of mitigating the operational and economic implications of an attack in the Air Domain alongside enabling the Air Transport System and affected government sectors to recover from aviation attacks the soonest possible. Other plans include the Air Domain Surveillance and Intelligence Integration Plan which coordinates activities of national air surveillance, the International Aviation Threat Reduction Plan which details the US counter-terrorism activities internationally, the Domestic Outreach Plan which ensures the participation of the relevant stake holders in implementing the support plans and the International Outreach Plan providing detailed framework for soliciting international support in improving global aviation security. All the above plans constitute the framework that is deployed by the US government in combating the war on aviation insecurity. It is prudent to note that while the above policies entrenched in the plans are specific to different aspects of aviation security; they coexist in a mutual way depending and complementing each other. When they are combined, they collectively create an integrated foundation necessary for an effective policy and guidelines of fighting aviation insecurity threats. The plans, however could not have been effective without efforts from different departments like the Department of Homeland Security, the Department of Justice, that of Transportation, Defense, State, Energy the office of the National Intelligence and that of the Director of the National Counterterrorism Center. Together, they have enhanced the security of the US and its interests in the Air Domain (Mc Neill, March 30, 2011). One wonders why the US should embark on such a comprehensive and expensive security touching virtually every security department and sector while there are still other areas like the ground security where similar efforts are needed. This is because the Air Domain is the most appropriate target for execution of terrorist attacks leading to mass murders. Since the culprits realized this new field, they have improved with each passing day staying at par with every new technological advancement. This implies that the concept of aviation insecurity is not a new one-at least not in the US (Elias, February 2, 2009). Since the onset of the aviation insecurity threat in the 1906s, the executioners of such acts have diversified their means of achieving the desired objective. The National Strategy for Aviation Security identifies three types of threats targeting the air domain. These are threats involving aircraft, infrastructure or hostile exploitation of air cargo. All these originate fro three main sources; terrorist groups, criminals and hostile-nation states. The culprits met out their terror in various tactics like hijackings, bombings, smuggling of people, weapons, and shootings. 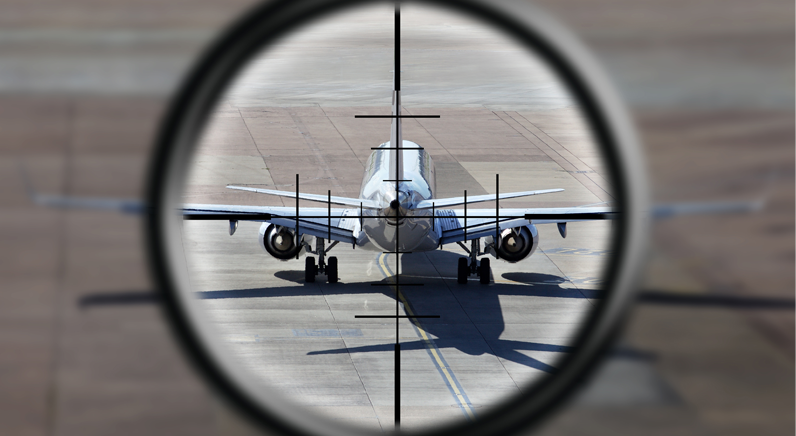 Aircraft threats are those directed at an aircraft or involving usage of an aircraft to attack other targets like buildings. A classical example of this type of threats is the 9/11 attacks. This threat is considered by terrorists who target a large number of people. Like in the case of the 2001 attacks that left more than three thousand Americans dead. In the case of threats to aviation structure, the targets are airports and navigation facilities. This was the case with the attempt by terrorists to attack passenger terminal explosives at Glasgow International Airport in June 2007. This type of attacks are uncommon given their small human target and do not always materialize like case of JFK Airport where terrorists were planning to bomb jet fuel storage tanks in the airport but were arrested before the exercise began (Elias, February 2, 2009). The last type of aviation security threat is that involving exploitation of air cargo. This is the commonest of the three. It has been exploited for decades by terrorists to convey terrorist operatives, weapons of mass destruction, weapon components, explosives and conventional weapons (Stewart, November 23, 2010). The Heathrow attempt to detonate a liquid bomb in a US bound plane is a classic example of this. In this case, there were no casualties as the plans were detected in time.